Aquarium Chiller basically functions to lower the temperature of the aquarium water making it suitable for certain cold water fish species like goldfish and koi, which generally prefers temperature ranging from 18 to 21 deg Celsius. This is particularly important especially during summer when water temperature can rise as high as 27 deg Celsius making the condition unsuitable for both species. Maintaining the water at lower temperature has certain advantageous in the sense that colder water means that the fish metabolism will be reduced and thus lower down the amount of food needed to feed the fish. With goldfish known for its characteristic of eating a lot and producing high discharge of waste, lowering down the water temperature would certainly help. Second, chilled water generally holds more dissolved oxygen, which is of course better for the fish to stay active. The principle behind the workaround of an aquarium chiller is very much similar like normal household air conditioning system. It has a gas compressor, which will heat exchange with the aquarium water and then it releases the heat to the outside environment. That way, the water stays cool and there is even a setting for you to adjust the gas flow so that you can control the temperature. Although one might argue that having a normal air conditioning system works the same as an aquarium chiller, it won’t be able to provide uniform water temperature for the fish tank because the water might still stay warm at the tank bottom. Buying an aquarium chiller is a good option if you are planning on keeping goldfish. The price tag will usually range between $100 - $300 for a decent branded unit but sometimes can go ever higher depending on the capacity. 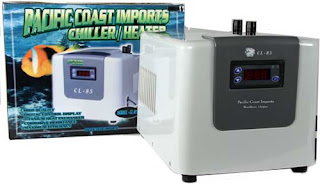 However, watch out for cheap chillers, which can be priced lower than market value in order to get your attention but normally fails within the first few months of usage. Somehow, aquarium chiller also needs servicing once in a while to replace the gas, so it’s best to get the help of professionals to assist you on this.